Filipino drivers say they are confident on the road and knowledgeable about what constitutes ‘good driving’, but when asked to identify key fuel-saving driving techniques, most were misinformed. 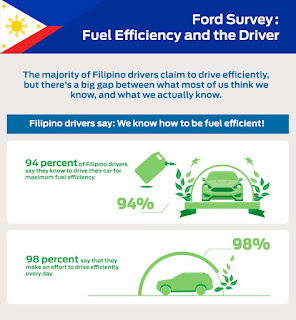 In a recent survey conducted by Ford Motor Company, 783 Filipino drivers were asked about their driving habits and fuel efficiency knowledge. 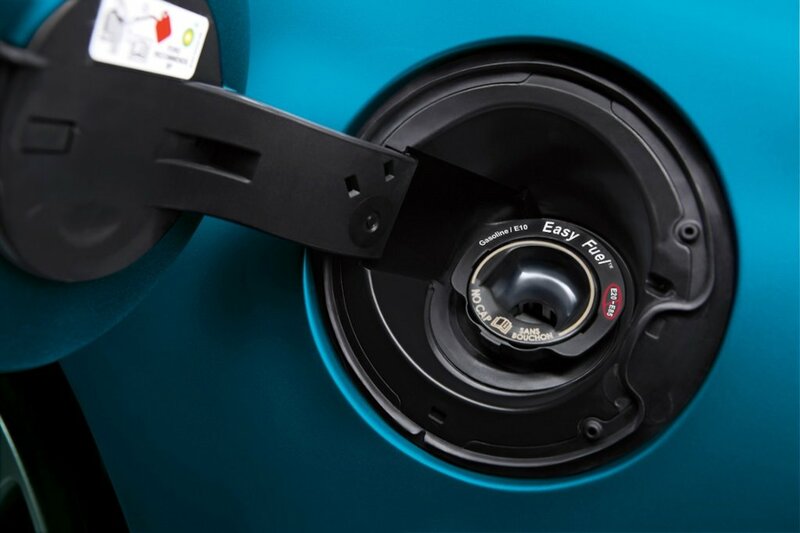 Ninety-four percent claimed they knew how to drive their car for maximum fuel efficiency, and 98 percent said they make a concerted effort to drive efficiently on a daily basis. So,what did Filipino drivers get wrong about driving tips that could help keep their tanks fuller, for longer? Habit #1: 34 percent of Filipino drivers don’t know that harsh accelerating and braking negatively affect their car’s fuel consumption. Fact: Aggressive driving – like braking harshly or taking off too quickly – is a major offender when it comes to wasting fuel. 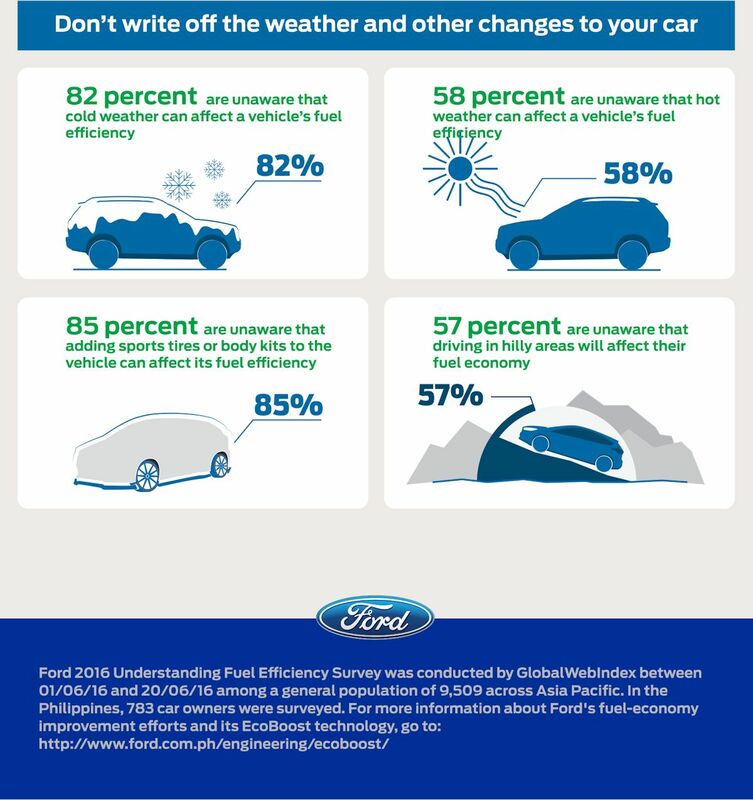 Habit #2: Almost one in five Filipino drivers believe that keeping the engine running while idling will save more fuel. Fact: Turning the engine off and restarting it again is actually more fuel efficient. If your vehicle features idling start/stop or auto start stop technology, you’re one step ahead. Habit #3: 84 percent of drivers are unaware about the fuel efficiency benefits of cruise control. Fact: Cruise control is a modern car’s secret weapon against wasting fuel. Maintaining a constant speed means you don’t waste fuel by unnecessarily braking and accelerating – and it also stops you from driving faster than allowed. Habit #4: Only 27 percent know to use GPS to map the quickest route before heading out. Fact: It seems obvious, but the longer you drive, the more fuel you’ll use. Both time and money can be saved by checking your route on your GPS system before you hit the road. You can use smartphone-based systems like Waze or Google Maps. Habit #5: More than half (57 percent) did not know that driving in hilly areas can affect fuel consumption. Fact: A long drive in the mountains will use more fuel than driving on a flat, straight road. Driving uphill uses more fuel as the vehicle is working slightly harder to go against gravity. Habit #6: Many respondents were unaware that cold weather (82 percent) and hot weather (58 percent) affect a vehicle’s fuel efficiency. Fact: Cold weather can reduce your fuel economy significantly as it takes longer for your engine to reach its most efficient temperature, so you may want to rethink any short trips in cold conditions. In warmer weather, pay attention to how and when you use your air conditioner. For example, when the weather is not too hot, you can drive with your windows down at low speeds. Avoid leaving the the air conditioner at full blast always. Adjust fan and thermostat to a setting that is just comfy enough. 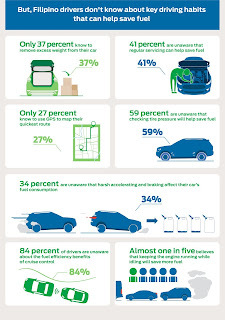 Habit #7: Only 37 percent of those surveyed knew that removing heavy items or clutter from the car can help save fuel Fact: Excess weight in the vehicle can wreak havoc on your car’s fuel consumption. Any extra 20 kilograms you carry can reduce fuel economy by roughly one percent. So try to pack lightly on that next road trip. Habit #8: 85 percent were unaware that adding sports tires or body kits to the vehicle can affect its fuel efficiency. Fact: Going for that “fast and furious” look for your vehicle may get you street cred, but the increased rolling resistance and drag will reduce your fuel efficiency. 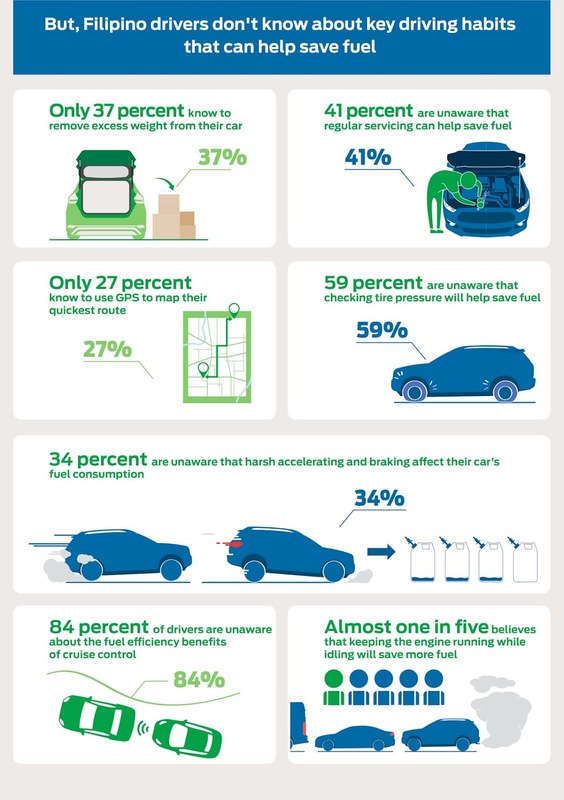 Habit #9: 41 percent of drivers were unaware that regular servicing helps save fuel, and 59 percent were unaware that regularly checking tire pressure also helps save fuel. Fact: Basic knowledge perhaps, but it’s all too easy to forget that a properly maintained vehicle and correctly inflated tires will help stretch your petrol dollar further. Fact: Cruise control is a modern car’s secret weapon against wasting fuel. Maintaining a constant speed means you don’t waste fuel by unnecessarily braking and accelerating – and it also stops you from driving faster than allowed. I got a bit confused here. Isn't it cruise control maintain a constant speed? Yes, cruise control helps you maintain a preset speed. If used right, your car will actually be less aggressive to throttle inputs. It also prevents overspeeding! Why is it cruise control a modern car’s secret weapon against wasting fuel? If the vehicle is at a preset constant speed? I disagree with cruise control, it consumes more fuel rather than driving smartly, like on an incline, cruise control will keep a constant speed while your rpm's go high, and it will still use throttle when going downhill. meanwhile you can use engine braking going downhill or go to a taller gear when going uphill. Yes you shouldn't use cruise control in hilly areas, and in cities where there is traffic. Cruise control should only be used on long stretches of highway. It's good to other country with long stretch of highways but for philippines isnot so traffic and short highway and so many cars. Habit no.6 is not true. -The engine is more effcient in cold weather because of more dense oxygen molecules. Modern engines today have efficient and improved thermal efficiency heating system that makes both cold or hot weather almost the same engine warming up time. You save more fuel in colder temperature especially on turboed cars (the intercooler works less)and more oxygen mass. The key word is shorter trips. I'm sure when properly warmed up, it'll work fine. You're wrong anon. Colder air temperature = Higher performance, but does not necessarily mean Higher performance = More efficient. As general knowledge you are right about colder air means denser, more oxygen molecules. Thermal efficiency aside, a modern combustion engine keeps a ratio of air-to-fuel mixture. Thus, more air = more fuel being feed to keep the engine running. Coming from your argument, if a cylinder is filled with more air and not enough ratio of fuel, it is called "Too rich" and no combustion/ignition will take place. Some of those aren't "habits"
Ever heard of hypermilling? That method is the best way to save on fuel.